Hundreds of acres of farmland have been damaged near Morton by suspected “deer poachers”, according to police. Two 4x4 vehicles were heard driving across fields in Stainfield, about a mile and a half west of Morton, at about 3am on Thursday. Trespassers in the vehicles were thought to have cut chains to open gates onto the fields so they could poach deer without the landowner’s consent which is illegal under the Deer Act 1991. A Lincolnshire Police spokesman said: “Unknown occupants have used these vehicles to trespass onto farmland to carry out deer poaching, having gained entry to a farmer’s fields by cutting the chains to gates along the quiet back roads. 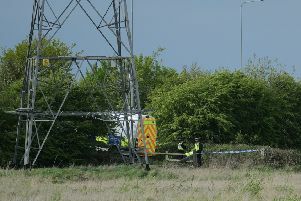 Police believe the vehicles hid in a field off the A15 in Graby, near Aslackby, before 3am. It is also suspected that the gang carried out the same crime in areas west of FOLKINGHAM. The spokesman said: “Did you see any suspicious 4x4 vehicles around this time or one which was parked up on its own? Anyone with information should call 101, quoting incident number 68 of November 10.